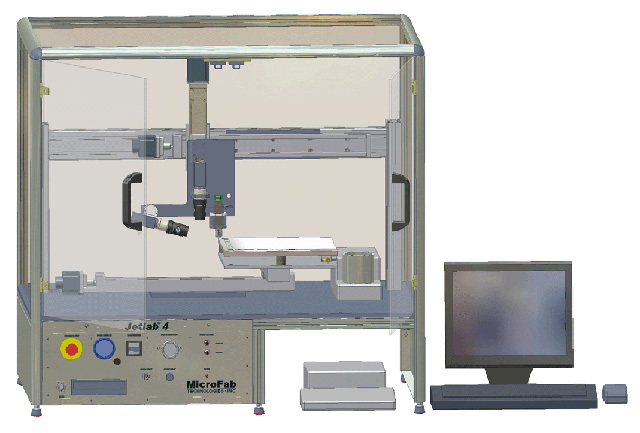 For applications that require verifiable precision, such as the creation of printed standards for explosives detectors, the jetlab® 4xl-B integrates an ultra micro-balance with a jetlab® 4xl Printing Platform. The printhead may be positioned either over the X-Y stages for printing or over the balance for weight measurements. All balance measurement and reporting functions are under the control of the system software. Weight measurement results can be used in the program to control printing of arrays/filled rectangles, including fully automated printing using the standard scripting technology of jetlab® print stations. Target substrates or objects of up to 50 mm height are supported. All of the standard features of the jetlab® 4 are included, plus an increased 250x275 mm² substrate size. The ultra micro-balance provides a readout resolution of 0.1 µg, repeatability of 0.25 µg, and total load capacity of 2.1 g (gross weight including boat). A special enclosure limits the evaporation rate. Together with evaporation compensation algorithms allows mass measurements to better than 1% accuracy. Within scripts, printing of arrays can be defined with a specified total mass and conditioned on stability criteria for the measurements of droplet mass and evaporation. CCD camera for substrate observation; heated substrate and / or printhead; Polymer Jet™ and custom printheads; image analysis routines for substrate alignment and drop analysis; computer controlled pressure/vacuum regulator.